Beyond Athletics NY Goes One-on-One with West Liberty Bound: Ellis Randall, JR. BEYOND ATHLETICS: How did your senior football season end up? ELLIS RANDALL JR.: As a team we performed well, we could have done better, but with the talent we had, we did the best we could. Individually, I feel I improved a lot, this was my best high school season I ever had. BA: What did you do in the offseason to make get better? Randall: I was in the weight room religiously, and focused on improving my weaknesses. BA: So what are your plans after you graduate? Randall: To attend Division II West Liberty University, major in sports medicine, minor in sports management, and play football. BA: Did you receive a scholarship to play football at West Liberty? Randall: Yes, it is a blessing to get a scholarship to play the sport that I love while working towards a college degree. BA: Did you ever feel at times that you would never play college ball? Randall: Yes, I felt that I played out-of-position to be recruited by any colleges in high school. It was very discouraging and it seemed like things were not going my way, but I am blessed to have a very good support system in my Dad, family, and CTC coaches that believed in me, never let me quit, and always pushed and taught me. Through it all, I maintained a very hard work ethic and it helped me get through the season. 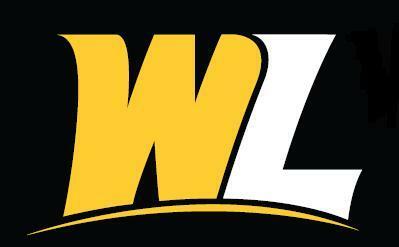 BA: What position did West Liberty recruit you to play? Randall: Strong Saftey. I feel like that is my natural position even though I played Linebacker in High School. BA: What other schools were interested in you? Randall: Clarion University, Mansfield, Villanova, and Delaware State. BA: Why did you chose West Liberty? Randall: I felt very comfortable there. The coaches treated me like family. It just felt like a place for me to grow and learn, the staff and players have established a family environment. BA: Do you feel like recruiting in this area has increased? Randall: Yes, it seems like we our gaining a little more exposure on a national level. Coaches Greg Hopkins and Kala Gause are always working hard to help as many kids as they can, and I am very grateful, it probably would not have happened without them. BA: What advice would you give to younger kids? Randall: First thing, stay focused. Have limited distractions, stay in weight room, and always work hard. Academically, keep your grades up and study early for your SAT's. BA: Well congratulations on your scholarship, great talking with you, hope you have a great career as you move on into Phase II of your life. Ellis Randall - RB/LB (Greece Olympia) Was a force on the defense! He improved greatly since the last Badgersports 7-on-7 in late February. He covered the flats, hook-to-curl and locked receivers down one-on-one with authority. Maybe one catch was made in his direction all weekend. Recruiting notes: Randall is a Class of 2012 sleeper, and would be a steal for any 1AA schools. 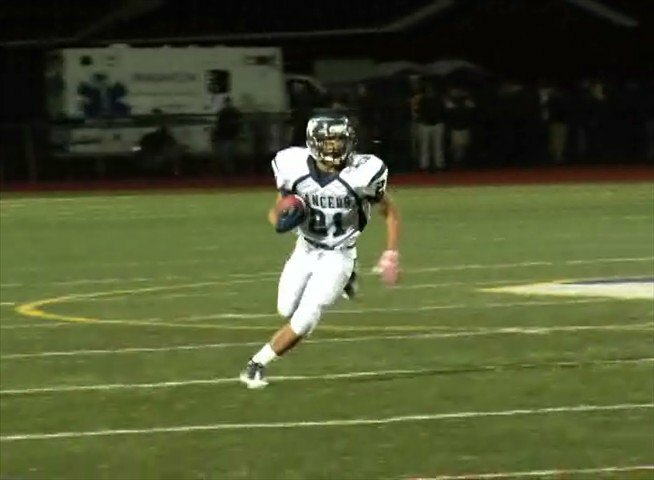 Ellis Randall – RB - (Greece Olympia) One of the most improved players of the Class of 2012 in Section V. Randall can easily be a 1AA kid, and is currently working hard to improve his exposure this off-season. If all goes as planned, Ellis will be the sleeper of this class. He is coachable, has good grades, and is ready, willing and able to improve his game at the highest level! Lookout for Ellis Randall this 2011 Section V football season! The Western NY All-Stars were pitted against Team Eastern NY led by highly recruited CB Wayne Morgan (Erasmus Hall) from Brooklyn, NY. Morgan holds offers from Alabama, Boston College, Connecticut, Maryland, Miami (FL), Penn State, Rutgers, and Syracuse. Team Western NY was led by Section V QB's Dominic Scavo (Hornell), and Corey Benedetto (Aquinas). And both were exceptional, Scavo got the start, and drove down the field and found Joseph Gause (Bishop Kearney) in the End Zone for the TD. Gause was covered by Morgan on the play. Benedetto threw a 40yd TD pass to Brenden Buish (Hornell), and WNY never looked back, winning 28-6. Games 2 and 3 were both losses to Maryland (36-20), and Eastern Massechusetts (20-12), however the losses were productive as some kids began to step up and make names for themselves. Marlon Anderson (East) proved that he could play multliple positions and ended up switching between OLB and CB. Anderson held his own in coverage against older multiple-offer kids from other regions, and almost had 2 interceptions in the tournament. Daron Roper (Rush Henrietta) made many plays from the Saftey position. Roper broke up pass after pass, QB's kept testing him, and continued throwing his way, he picked 2 off inßrd game. Speed, great coverage skills, and a nose for the ball are all strengths for Roper. Game 4 was another victory over East NY (14-6). Benedetto stepped in as a DB and broke up many plays over the middle. Buish had another TD catch and only dropped 1 pass in the entire tournament. His teamates nicknamed him Mr. Hands. He really showed alot of toughness catching passes all over the field with no fear. ATH Jeremiah Ortiz (Eastridge) rebounded very well from games 2 and 3. His ability to focus kept his head in the game. Ortiz, probably got the most work out of any other WNY player and he ended the tournament with an interception on his final play. Ellis Randall (Greece Olympia) also played mulitple positions on defense. Mostly DB, some OLB, Randall's physical play reminded WR's why they shouldn't come across the middle of the field. And his coverage skills defending RB's out of the backfield was excellent as well. WNY ended the day at 2-2, and was entered as the 20th seed in the Single Elimination Badgersports Championship Bracket and would be matched up against the 3-1 New Jersey Fly. Both Scavo, and Benedetto played some D, but they were like kids in a candy store on day 2 when the other Section V teamates walked into the Rutgers bubble. The arrival of class of 2012 athletes Jahmahl Pardner (Aquinas), Marcus McGill (Gates Chili), and Ishmael El-Amin (Wilson) marked the beginning of the day. They immediatly made a difference as Day 2 would kick off with a single elimination game at 7:30am. Pardner made plays on offense, and locked up any and all receivers that he lined up against, had 2 picks and showed why his stock is increasing among college recruiters everywhere! McGill had 2 TD receptions on the first 2 possesions and played both ways with authority, his offers will also begin to pick up this spring as well. It appeared that Pardner and McGill were the best two athletes on the field. El-Amin broke up any pass that came across the middle as a DB and made his presence known to many recruiters. WNY defeated NJ Fly 35-6 and moved on into the final round to face Virginia. Virginia came out red hot as they went 40 yards for the TD on the very first play. The offense turned the ball over and WNY found themselves down by 2 TDs within minutes. Defensive adjustments had to be made, however it was too late for a comeback as time expired and WNY lost 22-12 to Virginia. The surprise of the tournament was the play of East High's Marlon Anderson. Even with all the losses, Anderson asserted himself as an athlete for recruiters to began to put on their radars, he made a few big defensive plays at the end that kept the final score from getting out of hand. Congrats to all of the Section V athletes that participated in the Badgersports 7 on 7 Tournament. These guys all received national exposure, and an experience that will continue to help build WNY as a football hotspot!